A Couple's Holiday road trip turns into a Nightmare as they fight to escape the clutches of a deranged psychopath. With Halloween approaching it seems an opportune time to look back at this dark thriller from 2001. 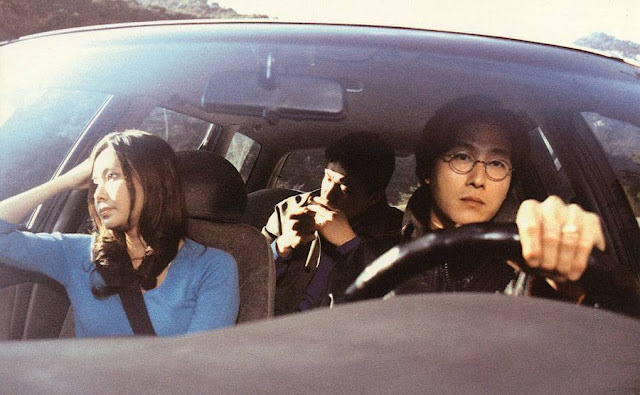 Jeong-hyun (Ju-hyuk Kim) celebrates the publication of his manuscript by taking his wife Yun-Hie (Sang-mi Choo) away for a vacation. At a stop, Yun-hie notices M (Joong-hoon Park) starring at her. As they both leave, Jeong-Hyun appears to accidentally reverse into M, and to defuse the situation they accept his request of a lift. Increasingly unnerved by their passenger's behaviour, they are relieved to reach the first destination of their trip and leave him behind them. After a night where a rock is thrown through their hotel bedroom, they leave only to have a dangerous encounter on the road with a 4x4. At the next town the 4x4 again forces them to nearly have an accident. A furious Jeong-hyun gets out of the car to confront the driver who turns out to be M. This is just the start of a psychological game that will ultimately escalate to violence and murder. The themes of masculinity and manipulation are present from the outset. In the films playful opening, Jeong-hyun pretends to have failed with his latest effort to become published before revealing his success. The purchase of a brand new car is representative of his newly restored status as he later offers to support Yun-hie with her career now. As the psychological games begins, his reactions are to respond with anger and violence and so falling into the trap being set by M.
Joong-hoon Park plays M with a malevolent relish. From his introduction staring at Yun-Hie vacantly, we know this is a character to be avoided. We learn little about him and this adds to the characters disconnect as is devoid of emotion and his sole intent is to destroy the lives of Jeong-Hyun and Yun-Hie. M manipulates the situations so that Jeong-hyun is seen as the aggressor, thereby trapping him. Ju-hyuk Kim as his opponent Jeong-hyun has a harder role in that his character's actions drag him and his wife further into the escalating nightmare. Indeed his character doesn't so much grow during the movie, but simply tries to survive. That he manages to maintain the audience's sympathy during the films final act is a testament to his work. Sang-mi Choo, unfortunately, has the lesser of the three roles to work with and Yun-hie is little more than the prize to be fought over. 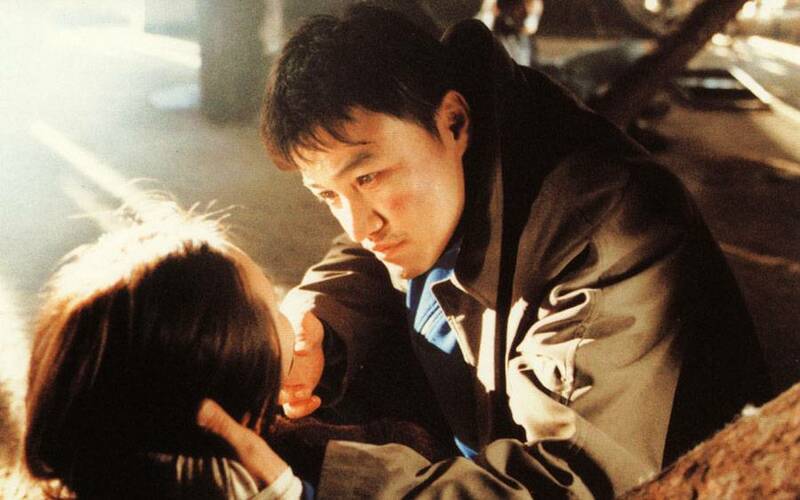 Sung-hong Kim creates a claustrophobic atmosphere throughout the movie with the majority of the film in either close up or medium shot, furthering the sense that this is a game from which there is no escape. M's manipulation of Jeong-hyun in the movies first half creates a lot of tension. Playing on his masculinity, M taunts Jeong-hyun about how he want's to sleep with his wife, leading to Jeong- hyun reacting with violence. In essence, they become mirrors of each other, something that the movies conclusion appears to reinforce. M is unable to sense anything anymore, whilst Jeong-hyun feels almost too much. The line Jeong-hyun utters "I taught him a lesson" after an early altercation becomes prophetic as it is he that is taught the meaning of violence. Like Robert Harmon's "The Hitcher" (1986), with which it shares similarities, the movie does require a strong sense of disbelief. After 60 minutes of tension brought about through M's machinations, the film steps up a gear and M becomes a character more frequently found in a slasher movie with his capacity to appear virtually indestructible, and in this latter part of the movie there are leaps of logic that those less favourably inclined will struggle to accept. At the same time, the movie gets more graphically violent as M pushes Jeong-hyun to stop him. Indeed, this is the film's fundamental flaw. M is portrayed from the outset, as someone to avoid, as the narrative logic is stretched at points to almost breaking point. Whilst not a classic by any stretch of the imagination, "Say Yes" is a very serviceable thriller that will entertain, provided that the watcher is prepared to accept the narrative inconsistencies and accept it for the roller coaster thrill ride that it is.